While recording another song for Buried Souls today, I thought I'd give a glimpse into my workspace! This is my own space on the bottom floor of our house, where my desktop computer lives and where I do the majority of my composing and recording. It is also a complete tip, and the guide that I put together just for people to be able to follow the order of the circles looks like an arcane star chart. Nevertheless, here's an insight into how I work. 1. First monitor! It's a 4:3 that I must have had since about 2006. When in music writing mode, this usually has Kontakt's overwhelming array of levers and pulleys on it - or otherwise it's got the Internet open because I've got distracted. 2. Second monitor! Mismatched with the other one, this is a 16:9 that I picked up a bit later on which is almost but not quite the right size to fit alongside the other one. I've been meaning to upgrade the first one but I've never really felt a pressing need to. Still, this is the one that houses Reaper's spaceship controls. 3. Logitech speakers. Again, these have probably been around since I came into the country in 2006 and have survived two house moves. I don't actually use these much in music composition because the sound is handled by an external sound card (see 11). 4. Ultra-professional monitor stand (a cardboard box that used to contain a pump that prevented the basement from flooding). I stand up when recording vocals and I used to hunch over the computer to click around and set things up, but having it at eye level is a lot more comfortable. I should really get one of those desks that you can raise to a standing position. 5. DELL QuietKey PS/2 keyboard, a relic and a misnomer because it's the most clackety keyboard this side of using a typewriter. I rescued it from the out-pile when we moved offices a couple of jobs ago - it's very comfortable to type on, has a satisfying feel to it, is built like a Sherman tank and weighs a ton. 7. Headphones - my primary way of hearing what I'm writing! These are a pair of Sennheiser PC-350 - I've been meaning to look at others because the headset microphone on this (which I use for recording game videos) has a slight screechy tinge to it, but they're very comfortable and I don't want to give them up. 8. The computer itself. Both the oldest thing at the desk and not the oldest thing at all - I haven't bought a new desktop since 2003, but parts have been swapped in and out over the years and it's now the Computer of Theseus. I can't remember whether any parts in it now (the case included) have been there from the very beginning or if it's a completely different machine. 9. A guitar! This is one of three that I own - I have a Johnson strat copy that I learned on (and have since modified into an electronically enhanced Frankenstein by drilling holes in it and grafting on mounts for a compact amp and so on), an Ibanez which is my main guitar, and this one. It was salvaged from my wife's grandmother's house after she died, has no markings on it indicating who made it, and could be an expensive antique (but is more likely worth $5 or so). I still can't play the guitar to any acceptable level - they're just used for idling around when trying to think up melodies. 10. A keyboard! This is a very basic one, a Yamaha PSR E243 which has no mod wheels or key velocity. 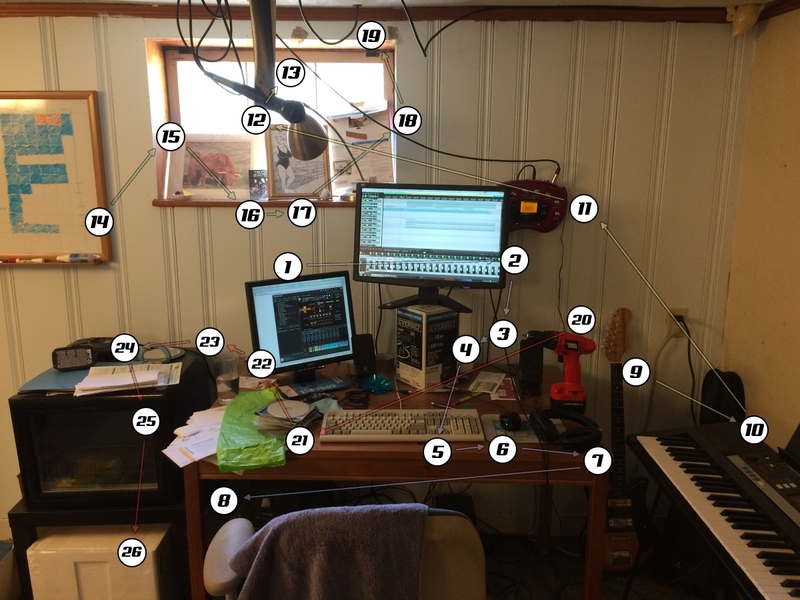 It's connected up to the computer and does what I need it to, though - and since I learned on the piano, it's very useful for experimenting and visualizing where a song is going. 11. This is a Line-6 Pod X3 mounted to the wall (there's no official way to do that - I just had some large bolts left over that happened to be the right size for poking into the screw wells on the back). It's an external sound card that acts as a digital amp for guitars, but I haven't used it that way in ages and I use it mostly for recording vocals instead. You can't buy this model any more, it's been superseded multiple times by now - I think I got it in 2008 or so when my original Amplitube guitar connector broke down. 12. My microphone is a Samson R31S, which is a $30 thing that you can get at Best Buy - I got it so that I could experiment rather than for any serious work. With the XLR cable to the Pod, though, it has no noticeable noise at all, and people seem to agree online that it's a surprisingly good microphone for its cheapness. There is no pop filter, a fact that I get around just by singing perpendicular to it. 13. Microphone "stand" made out of duct tape and suspended from a pipe on the ceiling, so I can't do laundry and record music simultaneously. It's up here because before I recorded The Poison Skies I read about the best place for a microphone being slightly above your mouth, so that you tilt your head back and open up your vocal cords more. I meant to get a slightly more permanent mount for it but I haven't found one I liked. 14. The whiteboard! This is where I chart progress when I have a serious project going on - three boxes for each song representing how far along the instrumental parts are, then a box each for whether I've completed the lyrics, the vocals, and got the song to a place where I can declare it releaseable. That's six boxes each, for twelve songs on Buried Souls - a total of 72, and I've filled in 42 of them. 15. A picture of some highland cows. Can't remember why this is there. I think my wife got it and it somehow ended up down here after we moved house. 16. Signed Iron Savior card! This came with a special edition of one of their albums, and is definitely not pre-printed because one of the signatures has a smudge on it where someone put their hand on the wet ink. 18. A box for a ream of photo paper. I had to put this up in the window during the summer because in the morning the sun reaches the exact angle to come blindingly down through the window. 19. Brown parcel tape mounts for said box. 20. Black and Decker drill/screwdriver. I should put this away, really - it's been here since we moved in last year and I was putting things on the wall. 21. Pile of DVDs containing British children's programmes recorded from old tapes by my parents and sent over here for me to look at and extract any treasures from. I have a Youtube account for these at https://www.youtube.com/user/TributeToThePast but it's been a very long time since I updated it. I should correct that. 22. Unused invitation to the sponsor/Professor Dinner at Anthro New England 2017, which I couldn't go to due to the birth of my daughter! 23. Water! Very important for keeping my vocal cords cooperating. I don't drink nearly enough of it as it is. 24. A pile of physical copies of furry pictures that I'm yet to find a home for, to be honest. 25. A drinks fridge! Was picked up for free from a yard sale shortly after we moved here. It is currently not plugged in and contains no drinks - it's been acting as a bits-of-paper stand for virtually all its lifetime here.